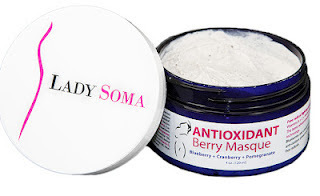 Share the post "Lady Soma Antioxidant Berry Masque Review"
Lady Soma is an all natural, healthy and holistic source of women’s probiotic supplements and skincare, which are all specially formulated to fit women’s needs. Their skin care line includes the Renewal Serum, the Antioxidant Berry Masque, and the Skin & Nail Treatment. Their supplements include the Lady Soma Detox, the Lady Soma Fiber Cleanse with Probiotics, the Candida Advanced Cleanse, and the Cranberry Concentrate with Vitamin C.
The Antioxidant Berry Masque ($32.99) is a delightful concoction of blueberry, cranberry, and pomegranate. Not only this facial masque is loaded with antioxidants, but it has essentials vitamins such as Vitamins A, C, and E. All band together to enhance cellular renewal and collagen production. It is usually not recommended to use a facial masque but once or twice a week. However, I’ve been using this masque every other day. It doesn’t give information on the web-site or container to let me know otherwise. So, I feel like it’s safe for anyone to use more than once a week, unless they start experiencing problems with their skin. It’s not like any other masque I’ve tried, because I usually couldn’t get away with using one a few times a week without provoking a breakout in the process. Don’t get me wrong, I’ve tried a few wonderful ones in the past, but I believe that this is the best one I’ve used in the past year. Applying a facial masque can be a very simple beauty routine if you’re not too familiar with using one. I simply keep this facial masque on my face and neck area for 8 – 10 minutes. 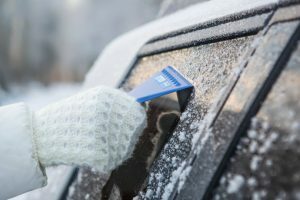 It gives me a bit of a good, tingly feeling. However, it is very tolerable since it doesn’t sting or burn in the least. Then, I wash it off with warm water, which doesn’t take much effort at all since it washes off easily. The results are fantastic, because my face has a warm and healthy glow after I use this product. I follow up with their Renewal Serum, which I’ll probably run out of soon since I only received a small sample. This is only because they wanted me to focus on the Antioxidant Berry Masque. It’s quite tempting to buy their full size serum, though. This product is really good, because it makes the skin feel really soft and smooth. It is normally $42.99 on their web-site, but you can currently buy it for $32.24.